Measles cases would triple if there were a 5 percent decline in measles, mumps and rubella (MMR) vaccine coverage in the U.S. for children ages 2 to 11, according to a study published in JAMA Pediatrics. Dr. Robert Jacobson, a Mayo Clinic pediatrician not involved with the study, says, "We as physicians have very successfully reduced what used to be 4 million cases of measles a year in the U.S. down to so few that a recent outbreak that numbered about 86 in Minnesota this year sticks out like a strange anomaly in the 21st century. In fact, the reason that that epidemic was not thousands, or tens of thousands or worse, was because so many of us are so well-vaccinated." Measles is a highly contagious viral illness that can almost always be prevented with a vaccine. "The MMR vaccine was developed in the 1960s and tested in tens of thousands of children to provide immunity against measles disease, mumps, and German measles–a highly effective vaccine that gives lifelong immunity, and it does a very nice job of really making these diseases so rare that most parents have never seen a case of any one of the three," says Dr. Jacobson. The MMR vaccine, says Dr. Jacobson has dramatically reduced deaths and illness. "More importantly, it has reduced hospitalization and complications from measles and mumps, and a very special complication from German measles," says Dr. Jacobson. "While German measles itself seems like a very mild form of measles, when it infects a pregnant woman, who’s never been exposed to either the vaccine or the disease, it will more often than not cause congenital rubella syndrome. This can lead to the blindness, deafness, and cognitive impairment of that child and, frankly, depending on the time of the pregnancy of when the German measles hit, can even cause a child to have autism." Watch: Dr. Robert Jacobson explains the importance of the MMR vaccine. In the decade prior to the availability of the vaccine, the Centers for Disease Control and Prevention (CDC) states nearly all children developed measles by age 15. An estimated 3 to 4 million people in the U.S. were infected each year, and an estimated 400 to 500 people died each year from measles. One of the most common complications of measles is a bacterial ear infection. Measles may lead to inflammation of your voice box (larynx) or inflammation of the inner walls that line the main air passageways of your lungs (bronchial tubes). Pneumonia is a common complication of measles. People with compromised immune systems can develop an especially dangerous variety of pneumonia that is sometimes fatal. About 1 in 1,000 people with measles develops encephalitis, an inflammation of the brain that may cause vomiting, convulsions, and, rarely, coma or death. 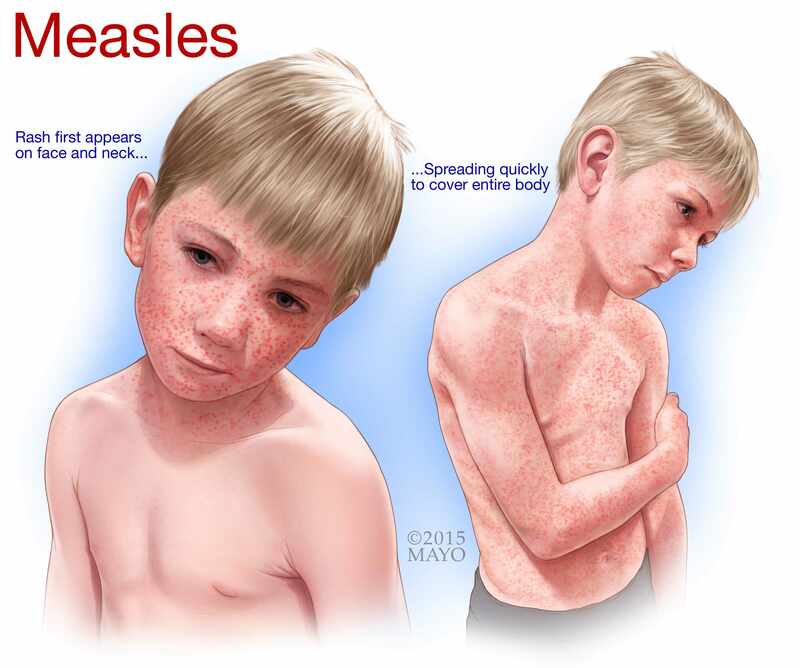 Encephalitis can closely follow measles, or it can occur months later. If you're pregnant, you need to take special care to avoid measles, because the disease can cause pregnancy loss, preterm labor or low birth weight. Measles can lead to a decrease in platelets — the type of blood cells that are essential for blood clotting. The CDC offers this educational video about vaccination and a comprehensive schedule of MMR vaccine recommendations.